Our 20th Annual Lear Golf Classic raised more than $140,000 to support our new Workforce Prep program. You would think that on a rainy Monday the last thing anyone would want to do is spend the day golfing. This wasn’t the case for the 246 people who, with positive attitudes and smiles on their faces, attended our 20th Annual Lear Golf Classic on September 10, 2018 at the historic Indianwood Golf and Country Club in Lake Orion. The event, presented by Leggett & Platt and benefitting Winning Futures, raised $140,000. The day started with a delicious breakfast that was followed by 18 holes and a grilled lunch. The majestic course included hole-in-one, closest-to-the-pin, and longest drive contests for a variety of valuable prizes including a two-year lease on a Chevrolet Camaro from Hamilton Chevrolet. Following golf we anticipated guests trickling into the dinner banquet wet, cold, and tired – a reasonable response to the day’s weather. Instead, we were greeted by laughter, smiles, and lots of camaraderie, as golfers mixed, mingled, and shared their best golfing tales. The program featured remarks by Kristina Marshall, president and CEO of Winning Futures, and door prizes including tickets to Lear Corporation’s Red Wings suite, DJI drone, and the opportunity to ride in a race car on the M1 Concourse performance track. Kristina Marshall (center), with the Old Course first place team. Money raised from the event will support our new in-class workforce prep program, addressing the critical need to better prepare students like Brooklyn Savalli, for life after high school and empower them with the skills, knowledge, and motivation they will need to realize a purposeful and sustaining career. Brooklyn is a Winning Futures alum and recent recipient of our 2018 Cupp-Hamilton Scholarship. Thank you to all our sponsors and guests. 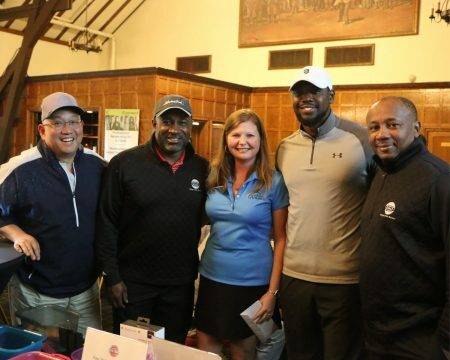 Visit our Photo Gallery for more pictures from the golf outing and contact Julie Rayes for future event information at Julie@WinningFutures.org or 586-698-4416.